There aren't many environments that cause more wear and tear on heavy equipment than a mining operation. You need a reliable parts supplier to be sure your equipment parts are available and shipping quickly. ConEquip wants to be that supplier. ConEquip parts can help keep your operation up and running with replacement parts for your mining equipment including Backhoe parts, Loader parts, and Excavator parts. We are able to locate new, used, or remanufactured parts that can ship to you quickly. We work with a number of suppliers and can source parts from all regions of the world. Our focus will help shorten your downtime, or keep your regular maintenance on schedule. 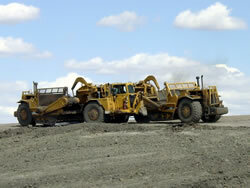 Talk with a ConEquip mining parts specialist today.